Nov 2008: MoU with AMG to sell general insurance business for RM274.8mil, representing a P/BV of 2.6x. Nov 2008: TY announced that he will not be taking private MAA. July 2009: BNM approved the sale of general insurance business. Feb 2010: Sales price of general insurance business revised to RM180mil. Apr 2011: Discussion on sale of 70% stake in General and Life Insurance to Zurich with a rumored amount of RM1.2 bil. AMG kept on revising downwards the valuation of MAA’s general insurance business (General) from RM274.8mil to RM180mil. Why? Could it be due to the poorer prospects of the business or the business is found more and more screwed-up as AMG delved deeper into its business??? 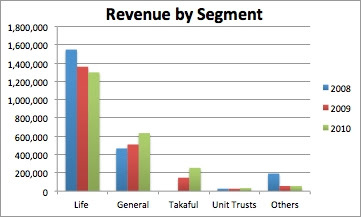 General’s revenue and profit had been increasing since 2008 whereas its life insurance business (Life) ran quite the opposite way. General’s revenue is about half of Life’s but General’s profits are far superior to that of Life’s. 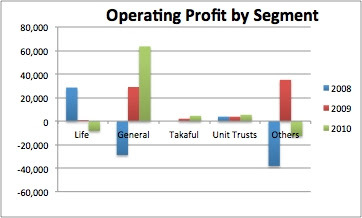 General’s operating profit (Note: Not net profit) at RM63.5mil whereas Life’s operating profit recorded operating loss of RM8.2mil as at 2010. 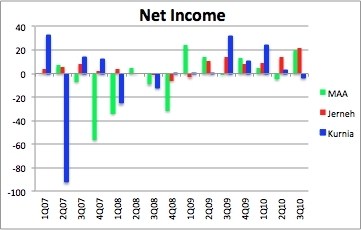 Another question: Despite General’s revenue and profit increase, its valuation kept revalued downwards by AMG. How much is Life’s business worth? AMG was only willing to pay for MAA’s General business at RM180mil but I guess TY thought this was too cheap for him to sell. Maybe TY will only sell it at above RM300mil (closer to the initial sale price agreed by AMG). Ok. If we just use sales as benchmark, Life’s business could be worth RM600mil. 70% of both businesses would be RM630mil ([RM600+RM300] x 70%). Jerneh sale at P/BV of about 2.1x. (not 1.2x as written earlier, sorry guys) Kurnia Asia is trading at P/BV of 2x. What about MAA? 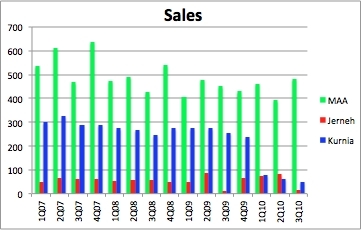 MAA’s business is about twice the size of Kurnia Asia and >5x that of Jerneh. Perhaps P/BV of 2.0x to 2.5x would be a better gauge? That would value MAA’s shares at more than RM2.00 already. As mentioned by Simon in the previous post, Zurich will certainly revamp the whole business and perhaps bring MAA’s businesses closer to Zurich’s performance. Let’s just say within the next 2 years, its profit margin could be improved from about 1% currently to about 5%, net profit will be at RM100mil. Attaching PE of 10x would value the business at RM1bil. 70% of it would be RM700mil or RM2.30 per share. Having said all these, the worry point is whether this deal could fail again like in the past and the management's past record is not helping to convince investors. My take: High risk, high return. You might have a profitable trade here but it could burn your fingers easily as well. It’s entirely your call :p Anyone could enlighten me further on this? Welcome further thoughts and commentaries! !